The chassis | What Car? The chassis will also almost certainly come from the 7, so four-wheel 'active' steering, air-sprung rear suspension, cornering roll stabilisation and variable shock absorbers will probably feature. There will also be four-wheel-drive versions, but not in the UK. At just under five metres from front to rear, the 5 GT is slightly shorter than a 7, but only the X5 and X6 BMW's large SUVs are taller. It will be offered as a four-seater with a full-length transmission tunnel like the concept car, or as a five-seater with a split rear bench. 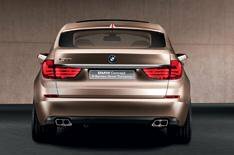 The rear end is like the Skoda Superb's: opening as either a saloon-style boot or an estate's full-height tailgate. BMW designers claim they invented the idea years ago and have been waiting for the right car to apply it to.